TSO Briargrove offers a range of specials throughout the entire year. We will always have something to fit your needs! Please contact our office at (713) 785-2022 to get the details of our latest and greatest specials. Includes 6 month supply of Vertex Toric contacts. 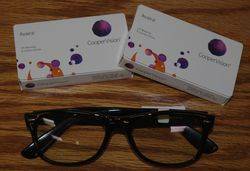 Includes selection from TSO special frames with single vision lenses and a 3 month supply of Avaira disposable contacts. **Some restrictions may apply. Not valid with any other offers, discounts, or insurance.